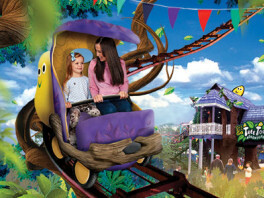 The ride began its life as Squirrel Nutty Ride in the Storybook Land area, which was opened in 1996 to fill the gap between Kiddies Kingdom and Old MacDonald's Farmyard. It stayed much the same for 18 years, until Old MacDonald's Farmyard was rethemed for 2014, and Storybook Land became defunct. Tree Top Adventure is a children's ride, though they must be with an adult. Once you have boarded one of the cars you seem to pedal your car around a large track which goes around this area of the park, although it is actually powered throughout. The cars use simple lap restraint bars, to prevent the riders from standing or moving in the cars while moving, as they do rise about twelve feet off the ground.